My post for today is a fun notebook. It started out as a card but as I began putting it together it started looking more and more like a notebook to me instead of a card. The pretty decorative papers used here is from the Spice Cake pack. I cut each strip 1" wide and the longest I cut at 3" and the rest are cut a 1/2" less than the one before it. I used the die cut for the tag. 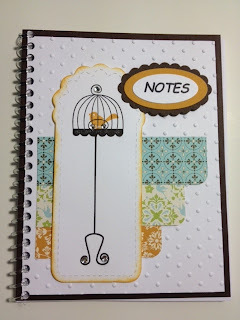 I stamped the bird, cage and stand using the "Aviary" stamp set. The "notes" is from a personal image I had made up yeas ago. I make notes of notebooks and it was a perfect one for me to order! I set the tag in place with Dimensionals as well as the notes layers. I then added some rhinestones on the cage and stand to give it a little bling and it was done! Now if I can get the photo on here later I will certainly share it with you. On a personal note here. After finally getting this post on here and all the frustration involved with it I can officially say that I am not happy with the changes that Blogger has made. I had to switch from Foxfire to Explorer in order to get the arrows to work to select the links or photo icon to add my photo. UNREAL. Why do they have to mess with things all at once? Why can't they make little improvements so we can adjust to them little by little? UGH. Anyway, here is my post for today! Finally! Wanda, what a cute notebook. I have never made a note book, but I enjoy seeing all that you make. I love the decorated papers, and just realized that I have that paper also. I will dig it out to make a card. Thanks for sharing your wonderful creations with us.